The tools I’m using to put together the Numenera Anthology PDF – Automatonera. 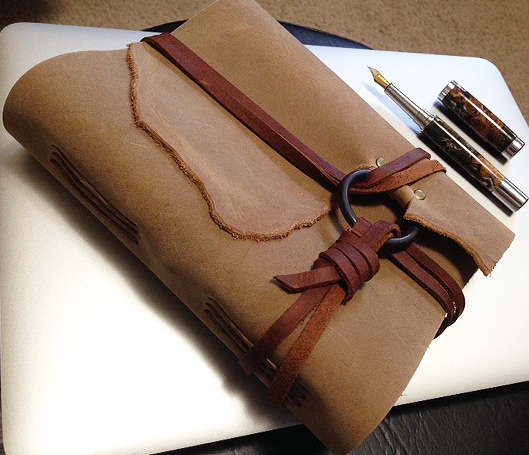 Journal, fountain pen and Macbook Pro. Just a few months after Monte Cook’s Numenera role playing game was published in 2013, I created this website to write essays and reviews on the game which brought me back to RPGs after a hiatus. The website also served as a conduit for gaming ideas in the hope that I would be creating some published material down the road. I’m excited to announce that I will be writing and publishing a licensed Numenera PDF anthology titled Automatonera. I want to thank everyone at Monte Cook Games for giving me the opportunity to release the anthology. The PDF will be produced in conjunction with Metal Weave Games, a company I admire for its stellar production of Numenera third-party material; the company will also be handling the interior art. Currently, I’m in the process of acquiring an award winning artist to render the cover, and will make an announcement as soon as I have the go ahead. It’s my first published work, so I’m planning ahead and making sure that there’s enough room for any unforeseen delays. I’ve since started work on the project which is made up of short stories, short adventures, a few pieces of interior artwork, and a cover. As the title infers, the anthology revolves around automatons in the Ninth World and their interactions with the world around them. It’s all new work based on ideas that were developed and presented on the website. OMG WOOO. I am so excited for this! Is there going to be physical/special editions of this for purchase when it releases/coming up to release? i.e. a signed version? Thanks for your interest! I haven’t looked at physical edition releases yet for this project. I really wish I could do one since I LOVE boxed sets and special editions. Depending on how well this one does, I may seriously consider it for my next release. Much appreciated! If there’s ever a chance of a physical copy being done, I would be glad to sign one for you!